Room size: ca. 8.0 x 4.70m with open extension to a 2.20 x 2.40m A/V bay and open kitchen. Ceiling height is 2.50m, reinforced concrete walls of 45cm, reinforced concrete floors and roof of 30cm. Room has on one side a large glass bay. When you look around any house or office anywhere in the world, there will nowadays always be an object made in China. The amount of products being shipped out of China -- mainland or Taiwan -- is astounding. It's hard to imagine the amount of crude oil transformed into one or another sort of plastic which, in turn, is transformed into something useful or playful. Most Western and even Asian manufacturers have parts of their products made in China to specification and with amazing quality and speed. Add to this the modern transportation facilities and your special customized product can be on your table within a week or just slightly later. It was a big step for China to become the production facility of the world. It transformed the country from a self-sufficient agricultural society into the largest raw materials importer on the globe. As the countryside is seeing a large exodus of the population to the big cities, in and around these cities more and more Chinese companies big and small start up which are not just providers of cheap labor. Chinese designs and manufacturing capabilities are growing rapidly. Education in China is good and so are opportunities for students to get educated abroad. This is creating a well-educated segment in China's huge populace. These new businesses are capable of doing what China relied on foreign companies for previously. Now they do it by themselves. They have the knowledge and -- for now -- the cheap labor at their hands. And most vital of all, they have access to the global buying markets. The route to them was paved already by foreign companies scouting to outsource cheap labor. Some Western companies now feel the shot in the foot when perfect and even enhanced Chinese versions of their own products come to market. And these need not be the old-fashioned sorts of illegal clones but are often genuinely new designs. That all these rapid changes in China come at a price to their local leaders and ordinary citizens is clear and not always pleasant for those who get squeezed in-between. With such a large population, squeezes are bound to be high. And now we have at hand the Yarland FV 34 CIIISA which squeezes something else just barely - your wallet. 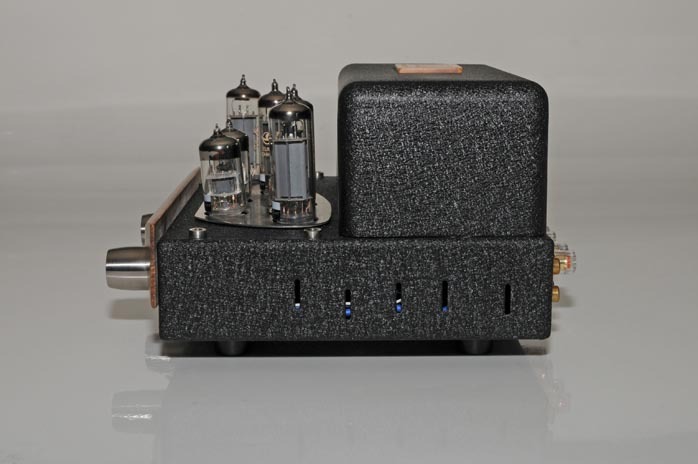 It demands so preposterously little as to nearly be an insult to audiophile expectations. Which is a very good thing we hasten to add. 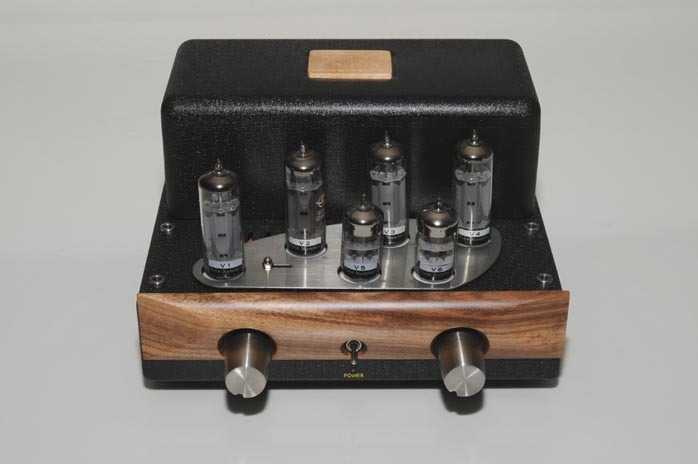 This is a full-blooded Chinese tube amplifier from one of the new startup companies. The first time we met this cutie was at the High End show in Munich this year. Dutch importer Crafty had taken up European distribution for Yarland and was looking for dealers around Europe. They demonstrated this FV 34 CIIISA and a bigger Yarland together with loudspeakers of their own design in a sound booth on the main floor. All who stepped in were pleasantly surprised by what they heard, especially when the little Yarland was at play. A look at the price list on the wall produced even bigger smiles. 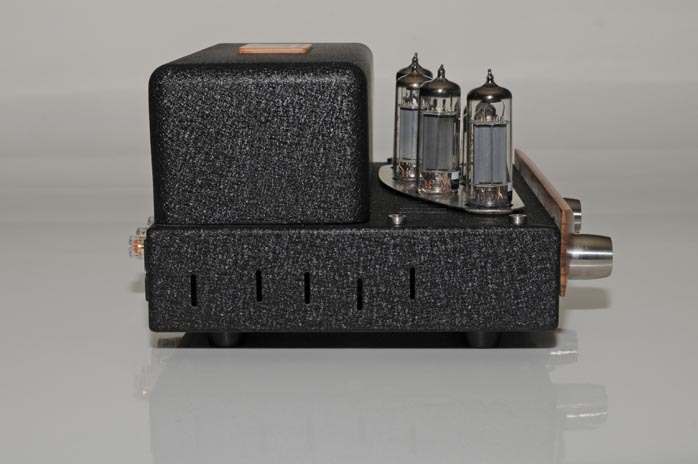 When we unpacked the amplifier, its 8 kilos were more than we expected from the 22 cm wide, 15 cm high and 22 cm deep chassis. In a separate box we found the six tubes that bring life to the FV 34 - four EL84 and two 6N3. 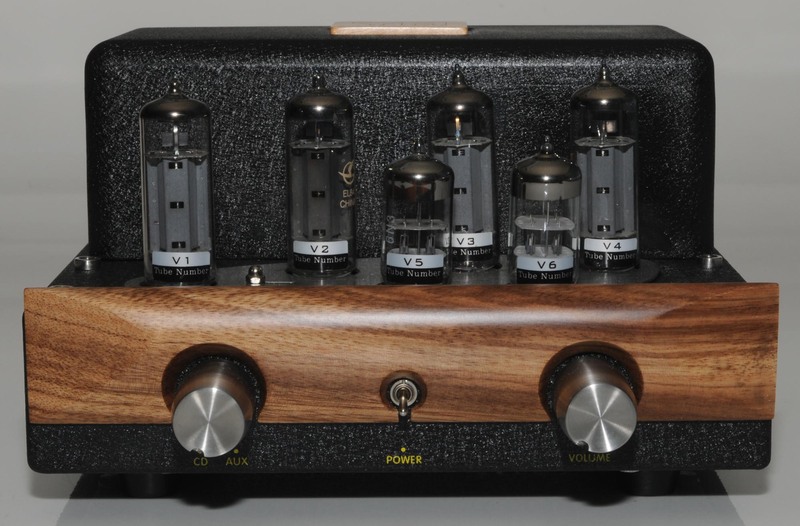 All tubes were branded Made in China and a sticker with a "Vn Tube Number" correlates 'n' as 1 through 6 with the equivalently labeled sockets. The amp is auto biased so there are no worries either. With the four EL84s in push-pull, the amp is good for 10wpc, sufficient for most loudspeaker of 88dB and higher sensitivity. The chassis is coated in a thick crackled black paint. On top of the transformer cover sits a small wooden plate reading Your Mate, Yarland Sound Equipment. A drop-shaped stainless steel dress plate acts as tube base. Four bayonet fittings can hold an accessory tube cover. 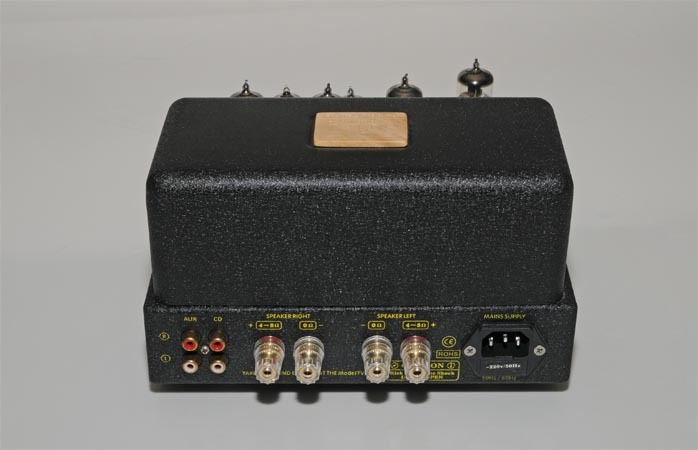 The front has two large rotary knobs, the input selector and attenuator. In the middle sits a tiny power switch. The fascia itself is made of wood. At the back we found RCA inputs for CD and AUX and simple WBT-type speaker terminals that accept bare wire, spades or bananas. At the right sits the power IEC. Stamped on the back also are the CE and ROHS compliance logos. After detaching the bottom cover, we had a peek inside. As with all later models, our loaner was fitted with big Clarity Cap coupling capacitors to replace the previous sub-standard Wimas. The build quality appeared very nice and components seemed easily accessible when necessary. The only thing a bit off in overall quality was the power switch connection. A relative long wire runs from the mains inlet all the way to the front. This could introduce unwanted noise. 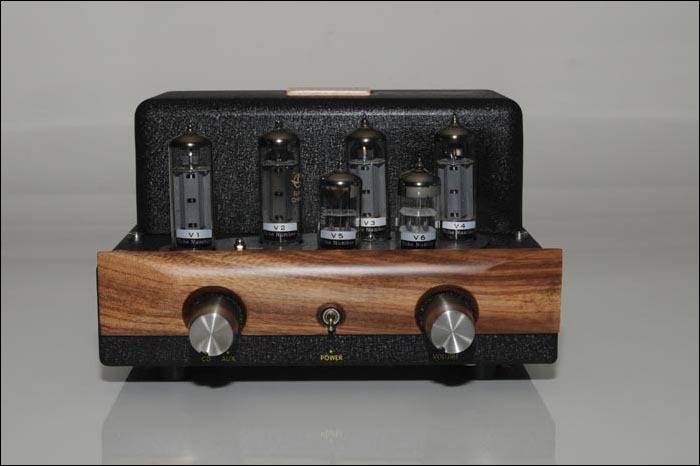 Tubes numbered V5 and V6 are the drivers and set up as high-gain phase splitters whose balance can be adjusted manually. From a schematic we found on the web, it appears that only the right channel has a hum balancing facility by means of a pair of resistors connected to ground. However, both heater supplies run from separate windings of the transformer. We'd find out soon how well or not this worked out.